He studied theology from 1957-1961 at Holy Cross College, Washington, D.C., and was ordained to the priesthood in the Congregation of Holy Cross on Feb. 4, 1961 at the National Shrine of the Immaculate Conception, Washington, D.C.
Father Walter taught chemistry during summer sessions at Notre Dame from 1958 to 1961, when he joined the chemistry faculty. A popular and award-winning teacher, he taught courses in chemistry, analytical chemistry, inorganic chemistry, inorganic preparations, graduate inorganic chemistry and coordination chemistry. He also ran the graduate chemistry program, and delivered numerous papers at meetings nationwide, even after a 1971 appointment as chair of Notre Dame’s Department of Preprofessional Studies greatly increased his workload. From that year to his retirement in 2005, he proudly watched nearly 5,500 graduates of the department embark on careers as physicians, dentists and other health professionals. 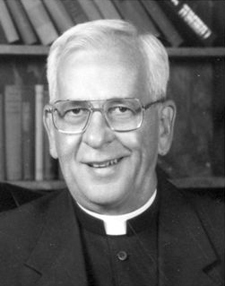 Visitation for Father Walter will be in the Chapel of Moreau Seminary on Sunday (April 22) from 3:30 to 9 p.m. with a wake service at 7:30 p.m. A funeral Mass will be celebrated at the Basilica of the Sacred Heart Monday (April 23) at 3:30 p.m.
Memorial contributions in support of the mission and ministries of the Congregation of Holy Cross can be made in Father Walter’s memory to: United States Province of Priests and Brothers, Office of Development, P.O. Box 765, Notre Dame, IN 46556-0765. Originally published by Michael O. Garvey at newsinfo.nd.edu on April 20, 2012.